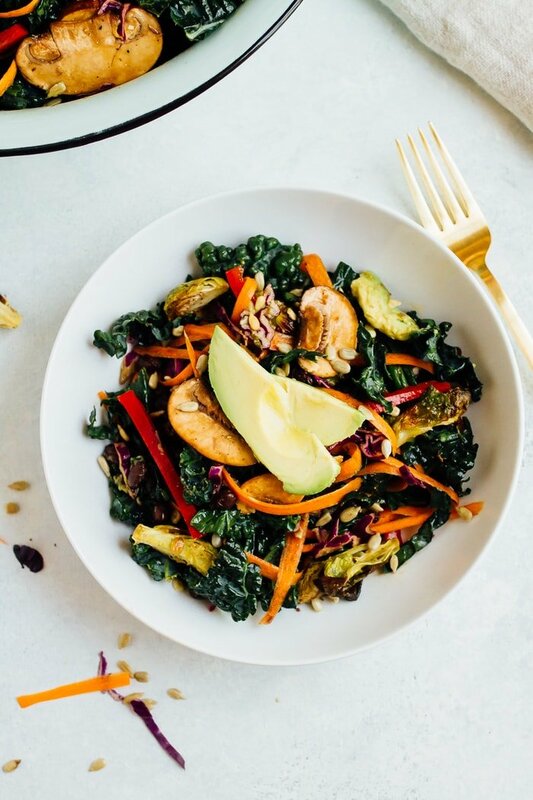 This kale detox salad is super nourishing without skimping on flavor. You’ll love the combo of crunchy raw vegetables, marinated mushrooms and roasted Brussels sprouts tossed in a light balsamic dressing. Have you ever felt like you needed to detox? I usually feel like I need one most after a vacation or a weekend that’s full of indulgences — like wine with the girls on Friday night, date night that includes a decadent dinner on Saturday and a day full of snacking on Sunday. Feeling this way makes total sense because alcohol, high sugar foods and processed junk can slow down or hinder our digestive systems. Of course our bodies have their own natural detoxification system but sometimes it doesn’t hurt to get back to the basics and help your body with the cleansing process. That’s my goal for the next couple weeks. 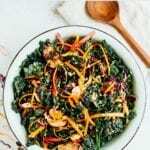 This kale detox salad is a great place to start because it’s packed full of delicious foods that contain vital nutrients and are perfect for cleansing. <– It has at least seven of the 14 liver cleanse foods listed in this article. And it’s tasty too! 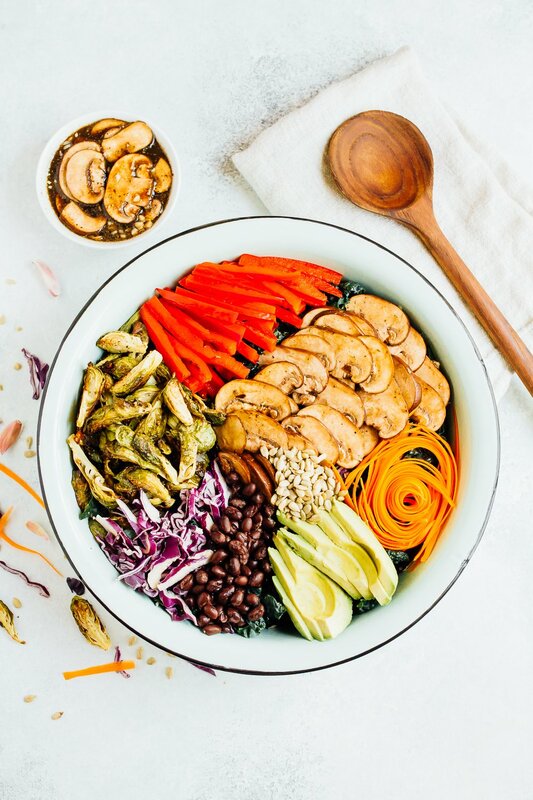 The roasted Brussels sprouts and marinated mushrooms add dynamic flavors as well as texture variety so the salad is really satisfying and can easily be enjoyed as a meal. Just be mindful that a couple of the ingredients can be prepped ahead of time — like marinating the mushrooms and roasting the sprouts. These things do take a bit of time so it might be easier to do them the day/night before and keep the veggies in the fridge until you’re ready to prepare the salad. That’s what I did and it worked out great because the veggies were already cool. That said, adding warm brussels sprouts to the salad is delicious as well! 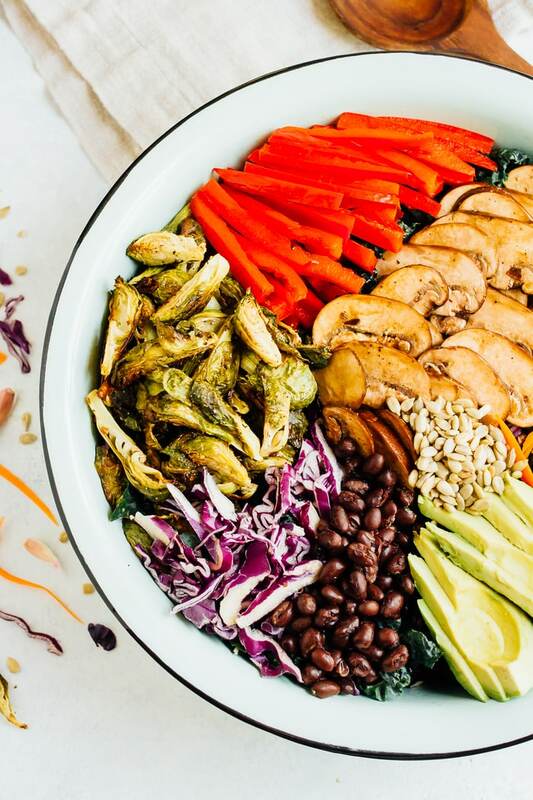 This kale detox salad is loaded with crunchy raw vegetables, marinated mushrooms and roasted Brussels sprouts toss in an easy balsamic dressing. Marinate the mushrooms: simply whisk together all ingredients for the dressing in a bowl and place mushrooms into the bowl to marinate. Stir occasionally (or shake if you’re using a sealable container) to make sure all the pieces are getting coated in the dressing. The mushrooms should marinate anywhere from 1 hour to overnight. Roast the sprouts: Preheat oven to 375°. Toss chopped brussels sprouts in 2-3 teaspoons of oil and sprinkle on a little salt and pepper. Add to a baking sheet and roast for 40-45 minutes (tossing occasionally) or until brussels sprouts are tender and brown. After marinating the mushrooms, add the mushrooms and remaining dressing into a large bowl with all the rest of the salad ingredients. Mix everything together. 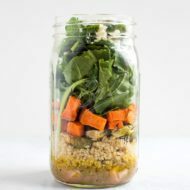 A large tupperware container works great for this because you can put the lid on it and shake all the ingredients to mix them up, but if you don’t have one, stirring everything together in a big salad bowl with a spoon will work. 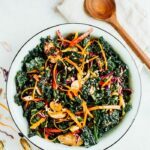 You can let the salad marinate a bit more before serving (this will help to soften the kale a bit) or you can serve immediately. To serve, place salad portion on a plate or bowl and top with an extra slice of avocado and a sprinkle of sunflower seeds. Leftovers can be stored in the fridge for 2-3 days. You should be able to get at least 2-3 large salads out of it. PS- You don’t have to be in need of a detox to enjoy this salad! It’s a great salad to add to your everyday routine. This salad looks absolutely deliscious! I always wondered how people eat raw portabellos…duh, marinate them! I will absolutely be trying this recipe. Thank you for sharing. No problem. I hope you like it Shannon. I heard that Kale and carrots do not release their vitamins etc unless lightly cooked, so I will lightly bake them as well as the other veggies. This looks so good. Just put it in my Evernote to make it later. Gorgeous salad! If I’ve been away for a day or two I tend to feel a little sluggish due to being out of routine and eating foods I wouldn’t normally but a day of eats with salads just like this and lighter refreshing food and I’m back to my old self no time 🙂 Happy Friday! Nice! The 7 Day Slim Down is definitely a good detox option. What is 7 day slim down? It’s a 7 day program offered through Tone It Up. I saw this on my FB feed this morning the moment I woke up and wanted to jump out of bed and start roasting mushrooms. Oh heavens this looks outstanding!!! I was thinking about beets on a salad and wanting to try brussel sprouts so this kills two birds with one stone! How long do you roast the beets and brussel sprouts? Hi Brittany! I always love your creative salad recipes 🙂 I did my own 7 day detox too after the Christmas break and felt so much better afterwards. Your body really does thank you for it! I’m like you though, sometimes I like to detox every now and then after a night out with my girlfriends or if I’ve been travelling and haven’t been 100% on my best eating behaviour. I checked out the conscious cleanse and will definitely give it a go next time I need a detox. I just had a really excellent raw kale salad last night, and I’m thinking I might want to experiment with them on my own. 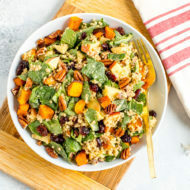 I like the combination of ingredients in this salad, and how it’s hearty enough to make ahead of time and have on hand for lunches, etc. I think I could even give marinated mushrooms a go – not really a fan of them raw, but they do sound good with that dressing. I am anxious to hear more about your cleanse. I find the whole idea fascinating, but I have never done one myself because so many “cleanses” require you to take a million and one supplements. I am a real food kind of girl 🙂 This salad looks delish, and I am especially intrigued by the dressing. Yum, and thanks for sharing! Would love to hear more about this cleanse! I’ve been looking for a whole foods cleanse to try out and this one sounds like it could be perfect! love it!!!!! thank you so much for this recipe…..your ausome!!!!! Wow, this salad looks amazing! I love all the color! Will definitely be trying this soon. wow! now that’s what i call a salad! 🙂 delicious! Yum!! This has all of my favorite ingredients in one salad, it doesn’t get better than that!!! Delicious!! This looks great! I just made four servings for this week’s lunches, and I’m looking forward to trying it. I just made this for my family and it was delish! Had it for dinner with roasted sweet potatoe wedges. Yummy ! Looks delicious. Would like more recipes. i’ve been so in love with mushrooms lately, but haven’t tried marinating them yet! this salad has so many incredible flavors, i can’t wait to try it! This looks delicious! I totally feel the urge to have “detoxifying” meals on Monday evenings after indulging on the weekend. This recipe looks filling and so so tasty. I will definitely be putting this together soon. 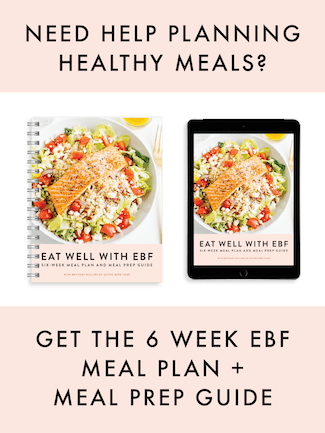 I also created a detox meal that you could check out here – https://chooseloveoverlikes.com/2017/05/15/salmon-detox-bowl/. OMG this looks insane! 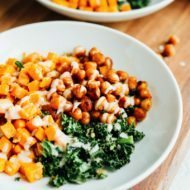 Probably the healthiest recipe I’ve seen in a while but it looks so delicious! Way to make those hard to eat veggies into an amazing meal! Thanks ???? Thanks Izzy!! It’s so good! 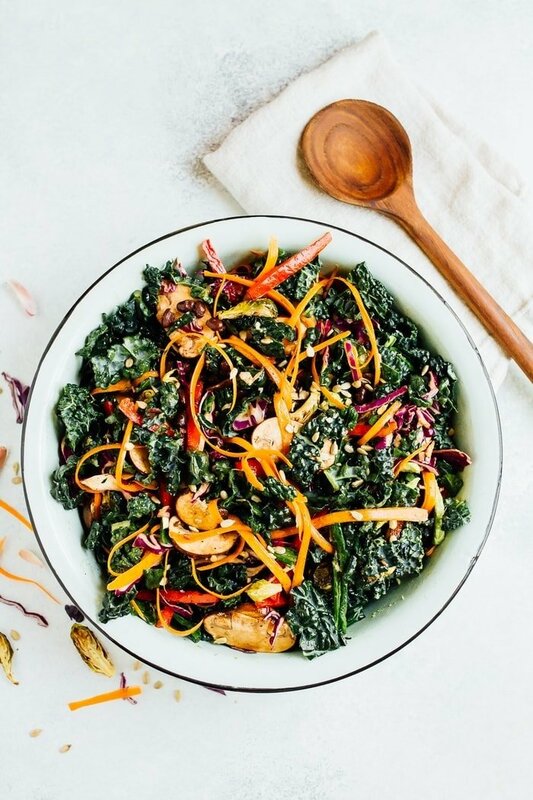 Wow, this kale salad looks killer! You did such an amazing job at plating it too! I just finished making this! It made a HUGE batch of salad, so I am really looking forward to eating this over the next few days! The nutrition info indicates the salad has 21 g of sugar. I see there is maple syrup in the dressing and carrots in the salad, what else is contributing to the sugar content? 21g seems high.